What a forlorn sign. I saw it on my daily walk and had to take its photo. No one else was giving it any attention. And no wonder. It has nothing to offer. Like most A-frame signs, it sits on a sidewalk of a busy street to attract the attention of people driving by. I could give it a few points for clarity plus the writing is easy to read. But that is as generous as I can be. What were they thinking? It doesn’t even give the name of the store! No reason is offered to encourage a quick turn into the shopping center parking lot. Does it prompt any curiosity? Any urgency? Any interest at all? Any emotional reaction? Or would you just ignore it? How does it measure up to the AIDA model: Awareness. Interest. Desire. Action. 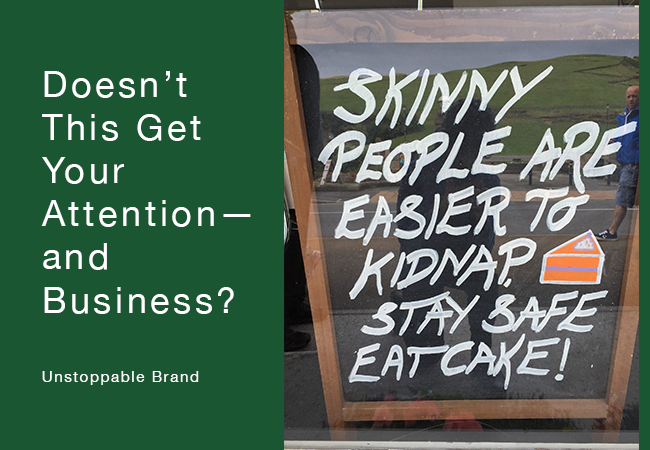 Does it make you aware of the product or brand? Well, we know they have scrubs but we don’t have any details so it is an easy message to ignore (especially while driving by). Even if we were interested, this is an anonymous sign. Does it elicit any interest? Nope. Does it create desire on the part of the passerby? Hardly. Does it spur action? No. The sign strikes out on all levels. I snapped this photo in front of a coffee shop in Ilfracombe, UK. Don’t you just want to go in? Even if you aren’t in the mood for cake? How could you not want to see who thinks up clever signs like this? And what else they have in store? If I hadn’t been on a tour with the bus ready to pull out I would have gone in. All I had time for was the photo and a mental note to stop in next time I am in the area. The beauty of this sign is everyone who walks by will no doubt read it and smile. It will plant that emotional moment in the brain. It has told a story with only 9 words. And it was a positive one that says, hey we care about you. Even if it is a cheeky comment. I applaud their creativity. And that makes me want to reward them. It is no different than a free sample at Costco. This is the principle of reciprocity at work. Once someone has given us something for free we want to pay them back. Signage, packaging, personalized shipping thank you notes, or other customer touch points are so perfect for this. And it doesn’t cost you anything! A single sign can be great fun. 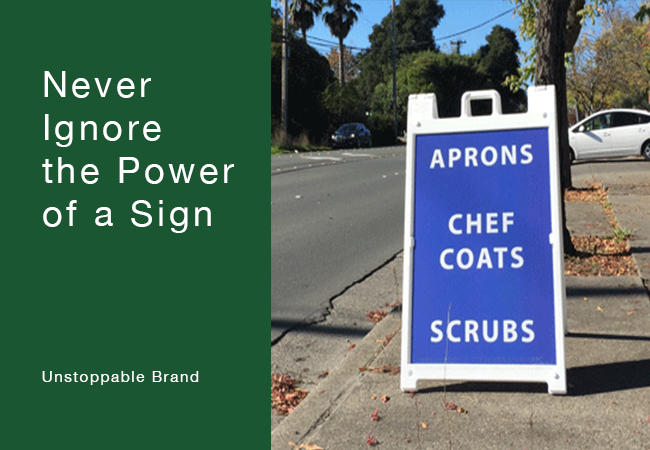 Change up the clever wording every day or once a week and you start to build a signage ritual. Not everyone thinks of signs as rituals but once you get people aware of your unique signage, that is what it becomes. People will anticipate your next change. They will make a point to look for it. They tell their friends. Do you think you aren’t creative enough to make up attention getting signage? Maybe you don’t have to do it all yourself. Clover Stornetta a Northern California diary has used their mascot Clo the Cow to bring them international recognition. It started with a single billboard in 1969 with this innocuous pun, “Clo outstanding in her field” alongside a cartoon image of Clo (in a field of course). Cute but not over the moon. But customers were attracted to this fun loving cow and started submitting puns on their own. Many were used in subsequent billboards. For the last 25 years there has been an annual contest for the best consumer submitted pun. After all these years there appears to be no slowing down of ideas. The Clo billboards sit proudly by our main freeway much to the delight of commuters (a ritual to watch for as you go by the city boundary). And the cow puns have piled up to where there are now two books devoted to them. 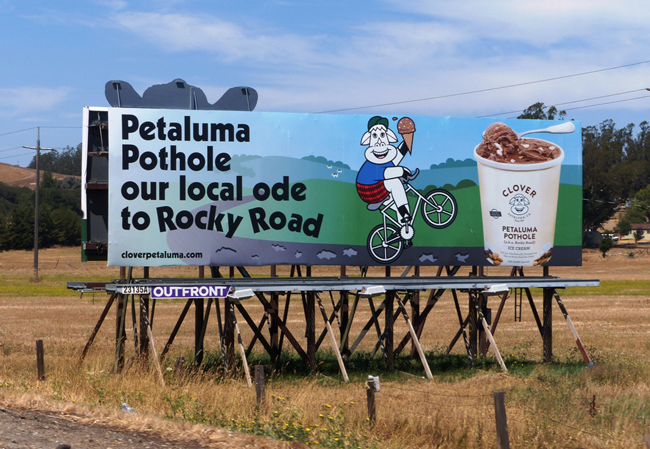 Clo the Cow and her billboards are now a signature visual brand element for the dairy, an annual ritual of their pun contest, and a daily ritual for passersby. And it all started with a simple pun. Have you given your intended customer a reason to respond? Does it elicit a positive emotion? A smile, a laugh, at least a nod? Does it give any sense of urgency? Does it show you care? Does it make them want to reciprocate by stopping in, buying something, telling a friend, or adding a snapshot on Facebook? Even simple signs can have great impact. 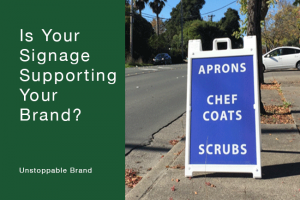 How can you make the most of these utilitarian marketing tools? Sign up for Story Sparks our free 30-day email course that will get you thinking like a storyteller.